Although we weren't physically present at the Oscars in Los Angeles last night, JCP was represented in a printed promotional piece for McDonald's - put together via DDB out of Chicago. 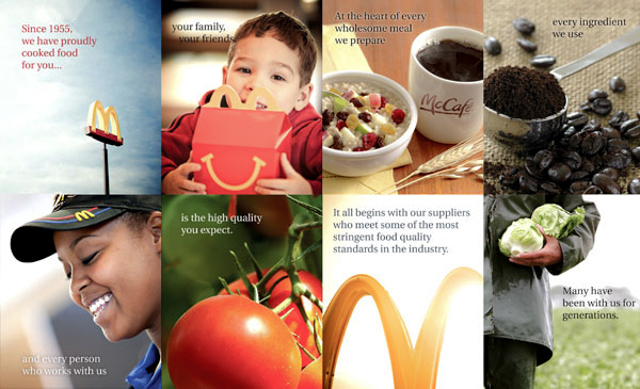 The ad / brochure was distributed at a dinner sponsored by McDonald's prior to the awards ceremony. The three JCP images are the first two images on the top row at left and the third image in the second row from left. We were happy to have the opportunity to contribute and be a part of the 83rd Academy Awards! Last week we spent two frigid days roaming the furthest reaches of northern Minnesota. Our project had us photographing seniors enjoying a variety of outdoor activities amid the winter environs for UCare via Initio. It was certainly the coldest production I've ever been a part of. At one point my car showed the air temperature reading -27 degrees. All things considered, the shoot came together amazingly well with a great crew and some very hearty subjects. With early mornings and long drives between locations, we put the iPhone to a little time-lapse test. We've been excited to try out a new sleeve designed and engineered by our friends at Canopy Co. Pairing this with a simple car mount and a few newly discovered Apps was a fun way to burn up some miles. This short film was shot and edited entirely on the iPhone. While the various editing Apps certainly had their limitations, we were able to add text, color grade, and pull in an audio track from the iTunes library on the phone. The crew and our last location - on the lake with Ken, our ice fisherman. A new location, a new practice space, and a revamped website are breathing new life into the One Yoga Studio. We spent two afternoon sessions with Kris Kiel, the executive director, and her talented crew of yoga teachers creating a series of portraits for promotional use. At the time of the shoots, final preparations were underway transforming the space into the tranquil One Yoga studio that will be used and appreciated for years to come. The grand opening took place last Saturday and all indications point to a successful day of re-introducing One Yoga and welcoming members of the community with free classes every half hour. If you haven't already, there's no time like the present to stop by, roll out your mat, and be present for a great session of revitalizing mind, body and spirit.